VirtualTourist.com, one of the world's largest sources of unbiased, 100 percent user-generated travel content, launched The Real Deal newsletter this week. The newsletter, which will be sent to subscribers on a weekly basis, will contain deals related to all aspects of travel. We have a worldwide network of real travelers with expertise in every market. They can identify deals that professional travel editors simply can't. It's like having eyes all over the world. In keeping with the company's user-generated philosophy, The Real Deal newsletter relies on VirtualTourist's nearly 1 million members to find the best travel deals available anywhere. Members post deals they find in the site's ''Deals'' section, then, newsletter editors pick the best to be included in The Real Deal. VirtualTourist Business Development Director, Brew Johnson, explains the advantage of this process: "We have a worldwide network of real travelers with expertise in every market. They can identify deals that professional travel editors simply can't. It's like having eyes all over the world." The newsletter's inaugural issue included a six-night package with air from Miami to Peru for $899 and a three-night stay with air at Las Vegas's Venetian for $575. Interested readers can sign up on the site's home page at http://www.virtualtourist.com. VirtualTourist.com is one of the largest online travel communities in the world and a premier resource for travelers seeking an insider perspective on travel information, from Las Vegas hotels to New York City restaurants. 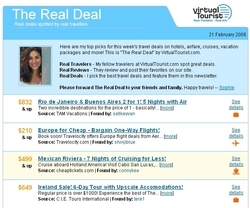 At http://www.virtualtourist.com, real people share real advice on places they've traveled as well as their hometowns; they research and plan trips, and they interact with other avid travelers via travel forums and email; over six million travelers use the site monthly. VirtualTourist boasts more than 1.6 million travel reviews and 3 million photos on more than 58,000 destinations worldwide. Unbiased, user-generated content on Hotels, Attractions, Local Customs, Tourist Traps and much more is posted entirely by VirtualTourist's more than 980,000 registered members from over 220 countries and territories, and the site's Trip Planner feature allows users to create custom print-and-go travel guides. Among VirtualTourist's awards and accolades: 'Sites that Changed Our World,' The Guardian; 'Favorite Website,' Newsweek; '35 Best Travel Sites,' Travel Leisure.